Blurb: Fast paced, well woven, and completely engrossing. This book certainly lives up to its name. Review: I know this book doesn't come out for five months, but as I didn't recieve this copy for review I don't feel bad about reviewing it super-early. Someone has to, right? ANYWAY. I loved this book. From the very first page I was hooked. I love that this book is told from the alternating views of a criminal legend, and a "police" legend. It was fascinating to see how both were very similar people who had been drastically changed by their circumstances. Maybe Day would have been a famous guardsman if he had lived June's life, and vice versa. What makes this story GREAT is those two characters. The plotline itself is rather generic. Dystopian government, at war with some other country, some people live lives of luxury while others die of plague. Ya know. That story. But seen through the eyes of our narrators what seems** like a generic story becomes something fresh and wonderful and fascinating. I couldn't take my eyes off this book. Hence, the Squeaky rating. So even though this book doesn't come out until November, you should pre-order it now. It's THAT good. *I am an amazon affiliate. If you purchase this book using my link, I will get a tiny fraction of the purchase, which goes toward contests. **I feel bad when I say this story seems generic. After all, since all of these dystopias are coming out at relatively the same time you know that Marie didn't read any of the other current popular dystopias before she wrote this one, there just isn't time! If this book had come out two years ago then it would have been the "original" one. Please note that I am not trying to offend anyone by calling it generic. I hope y'all can tell how much I loved this book. We think your "generic" comment is fair -- as you said, there are a ton of dystopian books coming out now, and they all have a "samey samey" feel if you read them too close together. That's not any individual author's fault. Anyway, great review, and yes, thank you for putting it out early! We've been wondering about this one ever since we read the opening pages through the publisher's online sneak peek! This book has been on my wish list for a while. So I'm glad to read this early review! This does sound really awesome. Lucky you, getting to read it early! I'm so glad you liked it, Enna! YAY! I know what you mean about dystopian plots seeming generic- I have been thinking that myself. I wonder if this genre is what is going to explode next (following the vampire, angel, werewolf, etc trend). Thanks for sharing this book- I have been seeing the cover everywhere and I was curious what it was about. I want to read this book so bad. I'm currently reading this -- and definitely agree with your review! 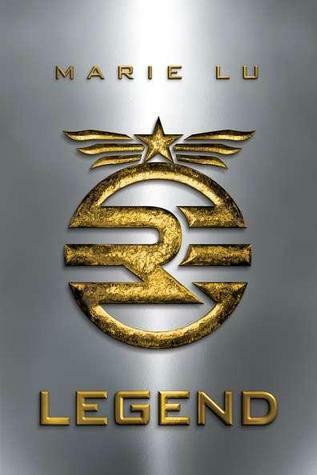 It's true that a lot of dystopians begin to read the same after a while, but I do think LEGEND stands out due to its characters. Wow. It sounds fantastic. Great review. I've been on the fence about this one. I think it's the cover that turns me off. Speaking of, have you seen the new super cool Aussie cover?